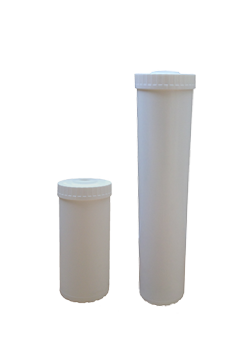 These cartridges are replacements for our point-of-use ecoTAC units, but can also be used to convert any Pentek Big Blue sized housing into an effective hard water treatment solution. Capable of treating water with hardness up to 25 grains per gallon (425 ppm) and flow rates up to 6 GPM (in the 20" size), they are great for low flow or point-of-use applications. The easy to change filter shell makes using the ecoTAC cartidges very straightforward; just swap it like a regular filter whenever a new cartridge is required! Typical lifespan for one of these cartridges is 2-3 years, making this form of anti-scale treatment very low maintenance. Please note that these cartridges are not compatible with Viqua AWP Series 3 part housings. For more information on ecoTAC cartridges, or if you have any questions on how this media cartridge will work with your water system, please call us toll free at 1-866-376-2690 and one of our water treatment experts would be happy to help you. Does not change the chemistry of your water - no salt required! Part #ecoTAC 4REPL 1.0 L 4 1/2" x 20"
Part #ecoTAC 6REPL 1.5 L 4 1/2" x 20"